Our lives consist of moments. Stitched together like the seams on a coat, these moments cloak us in awareness and possibility. But what if we miss our moments? What if we live in a bland state of wandering? Seeking growth, seeking passion--but missing the moments in which God tries to pull the thread through the cloth in the way we've dreamed of? Watershed moments are the turning points in our lives brought on by circumstances which stop us in our tracks. A new direction; a fresh perspective; an answered prayer; a humble surrender--these are the moments that redirect us; leaving us profoundly changed. Through a progression of seven types of Watershed moments (the Watersheds of change, unraveling, rebuilding, purpose, abandoning control], overcoming, and belief), Gari portrays life as a series of moments we encounter where we can face or turn away from change. A life marked by Watershed moments starts from the place where we live desperately hoping for some kind of new and freeing adventure. 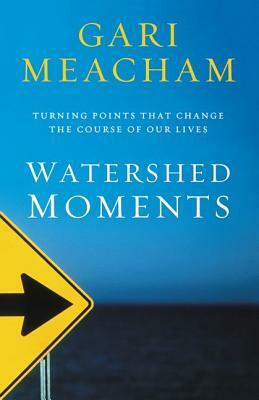 Through the lives of Abraham, David, Rebekah, Jacob, Rachel, Nehemiah, Peter and many more, as well as through personal Watershed moments in her life and the lives of several women who have written their own stories, Watershed Moments is a bold invitation to pay attention to the revelation God gives in the twinkling of a second at our moments of change. God uses watershed moments to position us to go one direction or another. It's at these Watersheds we utter, "I can't go back. This moment will change me forever." Gari Meacham is a writer, speaker, and teacher. Her passion for the word of God has made her a popular speaker throughout the country. Gari currently resides in Houston, Texas where she regularly speaks and teaches at her home church, Second Baptist Church of Houston, one of the largest churches in the country.